I LOVE this project because it introduces an artist who is still alive and painting today, as well as exposes my 5th grade students to a more “modern” medium ~ acrylic paint. Peter Max’s art is not only eye-catching and appealing to young children, but his subjects tend to the ones that are easily remembered and appreciated. We talk about his influence on pop/psychedelic/60’s art (beatles’ Yellow Submarine), as well as his modern take on painting iconic things and people. 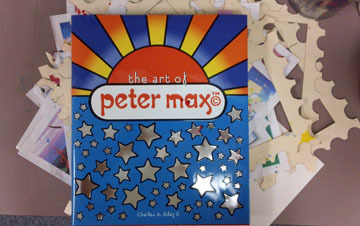 I love the book, The Art of Peter Max by Charles A Riley and we look at many different examples of his very distinctive style. This book is chock full of visuals! Peter Max paints very freely and doesn’t worry about getting that perfect paint color or line on his page. I encourage NOT cleaning your brush much and just “loading” your brush with 3 different paint colors and just explore the paint and colors. I love the shrieks I hear when I turn the paint plate upside down and hold it there for a minute or so to demonstrate to students the thick paint that doesn’t mix and mingle with other colors like other mediums they are used to using. The unique properties of acrylic paint (we talk about these too) really lends itself to this project and older students appreciate using a medium they have never experienced before. It is so flexible and forgiving they can’t really mess up and the bright colors used make all the paintings beautiful. This project always goes up on the classroom boards afterwards! I chose the postage stamp theme because it was a different way of looking at the paper and it celebrates all the philanthropy Peter Max has done through his art. I mention that every July 4th, Peter Max paints canvases of the Statue of Liberty and the proceeds of the sale of the painting goes towards her continued restoration and maintenance. At one time, Peter Max painted numerous paintings of Lady Liberty, donated the proceeds and, some say, he single-handedly saved Lady Liberty from disrepair. 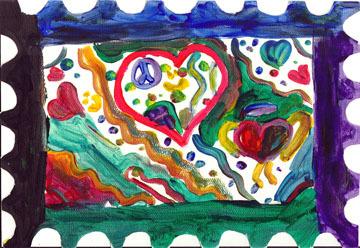 Peter Max also designed postage stamps to raise money for our National parks – hence the postage stamp theme! 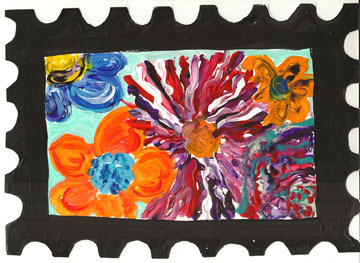 I demonstrate and encourage students to play with the paint and the colors with their brushes. There is lots of dabbing and rolling of brushes to get different effects. Starting with a stencil of a postage stamp, students trace the stamp outline which will become the paintings frame. 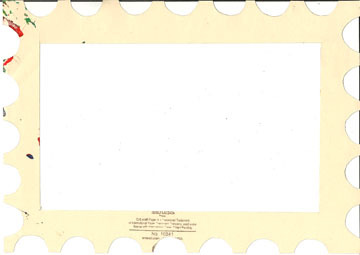 After painting and the paint dries, the final step is to cut out the postage stamp!